“It is smart, elegant and, with some minor variations personal to whoever made it, it follows the standard pattern both in the way it’s made and how it’s positioned and fitted. The ‘kicking strap’ or ‘jumping strap’, which stopped the ellum being knocked up out of the cups, is made by starting at each end with what amounts to the first half tuck of an eye splice with three very long strands which are then wall-knotted back along towards the middle of the piece of line with the ends tapered and tucked in the same way as a splice can be finished off. The swansneck is also started with the first half tuck of an eye splice, having first unlayed the piece of line for about 2” less than half it’s length. After putting two or three turns of temporary whipping over the half tuck and unlaying the other half of the line, this is then followed with a succession of crown knots using all six strands. 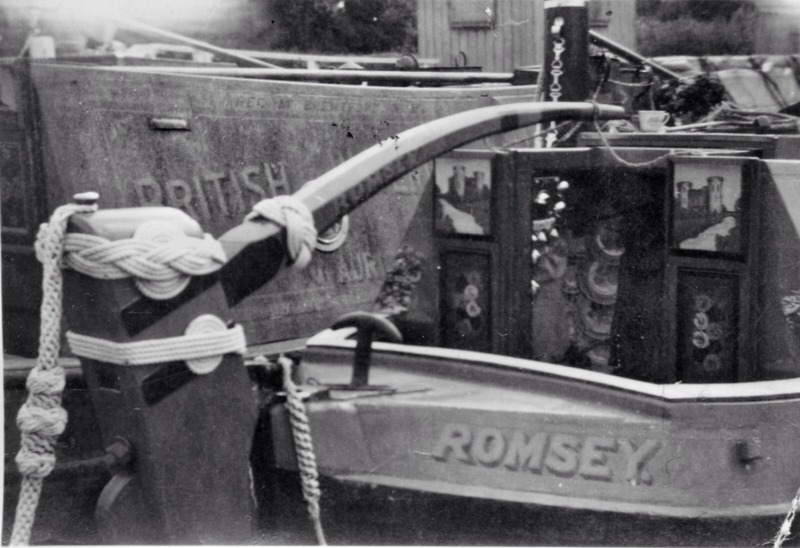 Sometimes the crown knotting continued for the whole way along over the thickened portion halfway along, but in the one shown on ‘Romsey’ the thickened section is wall knotted with all six strands instead. The thickened section is formed with a short length of rounded Ash, tapered down towards the ends, inside the crown or wall knots. The three strand turksheads halfway down the swansneck are made from single strands of the cable layed cottonline, and where there were two upper and lower ones positioned close to the ends of the tapered Ash peg they were pinned in place with small nails to stop them slipping out of place. After continuing with another length of crown knotting, the six strands were separated into two three’s and layed up back into 3-strand line tails again for about a foot length, and these tails were rolled into a small, tight ‘wheel’ which was pinned with some small nails to each side of the last board in the ‘ellum’ where it sticks up above the ‘floats’. The top and bottom ‘plaits’ on the top of the ramshead of the ‘ellum’ were also pinned in place with small nails, to keep them parallel with the rounded off top of the ‘ramshead’ which rose slightly towards it’s after face. This entry was posted on Sunday, February 7th, 2016 at 5:31 pm	and is filed under Boating. You can follow any responses to this entry through the RSS 2.0 feed. You can skip to the end and leave a response. Pinging is currently not allowed.